The Wright Wreport: T-fal 10-in-1 Rice & Multi-Cooker: The Question Is, What Doesn’t It Do? T-fal 10-in-1 Rice & Multi-Cooker: The Question Is, What Doesn’t It Do? T-fal 10-in-1 Rice & Multi-Cooker is a delicious multitasker. Photo from Bed, Bath & Beyond Web site. HEADS UP: We know, it seems like only six months ago that ‘twas the season to be jolly. How is it that every year you have no idea what in the world to get those on your list?! Never fear, the elves at VEVLYN’S PEN are, of course, on the case. Up until 24 Dec., we will introduce at least one or a series of products, items and brands that we believe is worthy of consideration as a holiday gift(s). Also look for at least one article dedicated to stocking stuffers and at least one highlighting themed gifts. Could be theater. Or food&drink. Fashion, maybe? You’ll just have to stay tuned and read all about it. Happy, responsible shopping! IT can bake up a chocolate cake and brown chicken in a pan. It can slow cook your goose and likely roast it, too. It can keep your potatoes warm and reheat your peas. 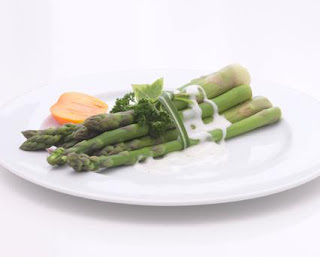 T-fal 10-in-1 Rice & Multi-Cooker comes with 26 recipes, including asparagus in soured cream sauce. Photo from T-fal Web site. It’s not a bird, it’s not a plane. NO, it’s not Superman. It is the T-fal 10-in-1 Rice & Multi-Cooker. In addition to the aforesaid, rounding out its 10 functions are rice/cereal, risotto, oatmeal, steam/soup and yogurt. The rice and multicooker (around $100) is one of the newest products from the French company cred-ited with creating nonstick cookware. It comes with a rice spoon, soup spoon, measuring cup, steam basket, ceramic-coated bowl, as well as 26 recipes. Easy to clean and dishwasher safe, the 10-in-1 cooker is endowed with Fuzzy Logic Artificial Intelligence that enables it to calculate automatically the cooking time for optimal cooking results. 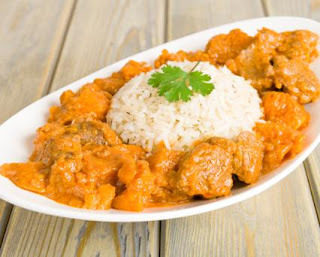 Caribbean pork and pineapple curry is among myriad dishes that can be cooked in the T-fal 10-in-1 Rice & Multi-Cooker. Photo from T-fal Web site. So don’t worry if you can’t boil water or you accidentally programmed the wrong cooking time. It can also be preset to cook something up to 24 hours in advance. Caribbean pork and pineapple curry, anyone? 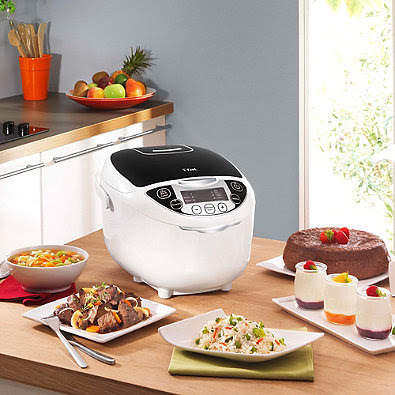 Visit http://www.bit.ly/1Yo3Nrt to learn more about the T-fal 10-in-1 Rice & Multi-Cooker, including where to purchase it. It's time to buy great pots for myself. Thanks for nice recommendation.